A gaming chassis designed with some portability in mind, the Corsair Vengeance C70 kicks off a new line of cases from Corsair. As such, then, there's a modern feature set to kick things off too. A pair of front-mounted USB 3.0 ports are the first evidence of this, but the flexibility throughout is perhaps more telling, even if it might be expected. For instance, the drive bays can be fully removed if you need more room inside, and there's positioning support for a pair of water-cooling radiators. Also, as well as the rubber grommets built into the case to help with cable routing, Corsair has now introduced latches underneath the motherboard tray, too. These are as simple as they sound: they unclip, you collect your cables under them and then pop them back in place. It's an unfussy, elegant and devilishly simple idea for keeping things tidy. It's clearly committed gamers who are the main target here, with the military look and feel very much with CoD and Battlefield veterans in its line of fire. The gimmick might be the military feel of the Vengeance C70, but Corsair also employs some subtlety here. It's not over-stylised, but still includes a protective cover for the reset button (we liked that a lot: resetting your PC should feel like launching a missile). Even the Military Green colouring of one of the Corsair Vengeance C70's trims is a little toned down from what you might expect (you may still prefer one of the two alternative colour options - Arctic White or the Gunmetal Black - though). One nice feature of the Corsair Vengeance C70's styling in particular is the way it lends itself to the spring latches that lock the sides of the case in place. The C70 is tool-less throughout, and the latches complement the look, while also adding something really quite practical. This extends, too, to the pair of carry handles on top of the case. They might be a little over the top for some, but we quite warmed to them. The Corsair Vengeance C70 gets the bulk of the basics right. Appreciating it's a mid-tower, Corsair has nonetheless left a lot of working room in the case. In fact, it follows its usual high standards here. Cooling is strong, with three supplied 120mm fans, and seven further mounts provided. There are some minor issues. The front panel's lack of eSATA might rankle with some, the window on the one side feels a little bit of an indulgence, and it doesn't quite feel as tough as you'd want a combat case to be. But if you warm to the aesthetics, the Corsair Vengeance C70 is a very strong mid-tower chassis, priced at £120 in the UK and $140 in the US. Corsair has shown real commitment to the military design of the Corsair Vengeance C70, which may isolate some, but actually holds together well. We've been big fans of the white Corsair cases in the past, so if the olive drab look doesn't work for you then the Arctic White might. The military design, which may put some people off, works really quite well. You might want to choose carefully which of the three colours you opt for - from the choice of Military Green, Arctic White or Gunmetal Black - though. The few innovations, such as the cable latches, are extremely helpful. It's also portable, tool-less and a very flexible mid-tower gaming case. Aside from features of the look and feel, that people will react to in different ways, it would be nice to have some more front panel connectors. The high price tag might also be an issue. The Corsair Vengeance C70 is targeted at the enthusiast gamer, and so the price is almost expected, but anything north of £100/$120 has to be pretty special. Luckily the C70 is pretty darned close. Corsair has got the bulk of the basics right with the Vengeance C70, and unique inventions such as the cable latches are extremely helpful. There's no radical shake-up of the Corsair formula inside, but there didn't need to be. Corsair is really making some fine chassis these days, and the Vengeance C70 is certainly making a mark for itself. 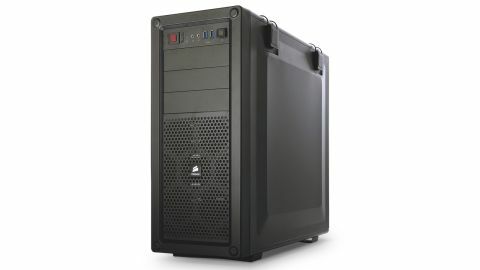 Overall, it's a strong mid-tower gaming chassis. You pay a slight premium for the styling, but the Corsair Vengeance C70 packs its punches where it matters.